I'm getting a lot of questions from people who have seen this class advertised at Bead and Button, asking how it is possible to fire metal in a microwave. I admit that I can't even fathom it; can you point me to a web page that can explain what temperatures are achieved, and for how long they can be held, and why the metal doesn't simply arc and spark in the oven? It's a mystery to me, but I'd love to learn what you are doing. Can you fire Bronze Clay or Copper Clay in the microwave kiln? No, you cannot fire (sinter) Bronze Clay or Copper Clay that requires the use of carbon in the microwave kiln today however; I am in the process of testing the NEW COPPER CLAY. One has been created by Art Clay and another by Hadar Jacobson; neither requiring the use of carbon and the extra tools. I will post my results as soon as my testing is completed. I have a dark discolored spot in the bottom of my kiln, the next piece I fired kind of exploded all over the kiln. Have I ruined it? Designs by Sylvanye Glass Studio said…. I hope my answer helps………………. How wonderful you are doing this blog, just when I'm getting into using my little Fuseworks kiln. I have a "big" programmable kiln for use with PMC, but bought the microwave one to save on electricity. It seemed a fine way to do a few dichro cabs for my PMC work. Anyway, I've been running into the problem of one layer slipping off/alternately cracking into several pieces. I've been using dichro with a base or top layer of black or clear (same COE). I even tried one single piece of dichro with no top or bottom layer, and it still cracked in half at 4 min. I have an 800 watt microwave with a turntable I bought at a yard sale for $5, and have been running the fuse for 3 to 4 minutes with the turntable disabled as per kiln instructions. Sometimes when I look at 3 min., it's not done, and put it in 30 seconds more per kiln instructions. So, does glass thickness have anything to do with it? Should I use a fuseable glue to hold the pieces together? Is the highest setting too much and should I back off on the highest power? Does the extended time period have anything to do with any of my problems? Some of my pieces have come out fine, but most are not. I'm spending a lot of time in trial and error, and that can add up with dichro. Sorry, lots of questions, but no answers readily found. I enjoy using the kiln, but want more consistent results if possible. Thanks so much. Note: If glass heats up to hot to fast it will crack. • Create your design with no less than two layers of glass. • Pre-heat your glass for 2 minutes at 70%. This will allow your glass to heat up slowly and evenly; otherwise, it will crack. • Next, without opening your microwave door, turn your dial to 4 minutes on High (your microwave oven automatically reverts back to High). Then open and peek briefly at your piece (a rush of too much cold air can cause your piece to crack). • From this point start adding in 30-second increments until you get the desired look. • Add the total minutes and seconds up to give you the total Fusing Time; this does not include the 2 minutes warm-up. 1. DO use your turntable. Despite what you and I have both read, you do need the turntable. Glass wants to be evenly heated just like in a regular kiln and the turntable helps to ensure this. 2. 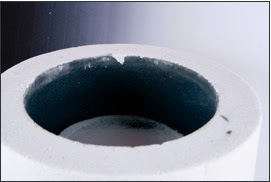 A “cold spot” in your microwave kiln’s top (hood) can also cause your glass to crack. A “cold spot” is where a chip of the black granite is missing thus not allowing the heat to reach that specific area causing not only uneven heat distribution but also the design facing that spot to not fuse properly. Yes, glass thickness, the type of glass, the number of layers, etc. in the MK has an affect on how long it will take to completely fuse a design. Your glass slippage is generally due to unbalanced layers of glass. Heat pulls or draws glass and if it is unbalanced will draw that unbalanced piece down and away. The glue you are using is probably fine but, if it is not completely dry, your piece will crack. Follow the instructions I have given you and you should be okay, assuming it is an 800-watt microwave. • Do not remove the MK from the oven without venting it for at least 10 minutes. This can cause shock to your glass also. Looking forward to hearing from you with positive results. I'm happy to find this site as I just watched a YouTube video about fusing glass in the microwave using a microwave Kiln. I'm going to do some more research before I invest in this though. Do you recommend one brand of MK over another? Hello Sally, so happy you found my site. As a glass fuser and instructor, I always like to test products before I recommend them and in this case, it is the MicroKiln out of Canada. I have worked with this particular MK and others over the course of 2 years and have found the MicroKiln to be the best thus far and have become one of their US distributors. In addition, the step-by-step instructions you receive with your MicroKiln were written by me an end-user. In addition, if you purchase one of my MicroKilns, you would be free to ask me directly any questions regarding its usage in the design of your jewelry. You can find information regarding the MicroKiln on my Designs by Sylvanye Glass Studio website at, http://www.designsbysylvanye.com. Where can I purchase the MicroKiln that you speak about? It sounds like you have done all the testing and can help if we have any problems. Can you give me some information without me having to go out to different websites and search for it. Can I purchase a Microkiln from you and if so what all do I get and what is the cost. Yes, I have been testing microwave kilns for a while now and know that the MicroKiln can do all as advertised. Payment can be made via PayPal or via any major credit card. So sorry I have not replied to your latest questions or comments but I have been on Christmas Vacation. Beginning Tuesday, December 29 - I will begin posting your questions & comments along with my response(s) in a separate dated post entitled, "Questions & Comments." Many of you have asked some of the same questions as others (via this blog, my website or my email address), and rather than have you read through my entire blog for answers or respond to you in an email, I thought putting them under a central posting entitled, "Questions & Answers" would help facilitate you obtaining an answer sooner. Hope this helps and I look forward to hearing from you. Don't forget to bring the New Year in with a BANG! Any one of the fine silver clays mentioned above can be fire successfully in the MicroKiln. Firings have been conducted with and without stones and glass. If you are using glass in your fine silver clay design you must pre-fire the glass to the desired shaped before setting it into the clay. I realize this sounds like a common sense thing to do, but you would be surprised at the number of people who ask me about firing glass cabs and beads with fine silver clay. Below are simple designs using PMC and Art Clay Silver (not mixed together) with and without a glass cab. Both were fired in the MicroKiln; however, ones without glass were fired at a different time using an entirely different firing schedule. The key to having a successful fine silver clay firing is the sintering. Anyone can fire fine silver clay, but if it is not sintered it is not considered a successful firing and thus break due to its weakness. Sintering to me is the process of fusing (melting) silver particles together to form a solid mass that is very strong yet can be bent without breaking. Yes, a sintered piece can be broken but that would be considered a deliberate break. Any object that can flex with enough bending will eventually break. My name is Sylvanye "Sam" Roh, a full-time warmglass artist and instructor. I have been testing and working with this revolutionary product since June '07 and started teaching the effectiveness of its use in the design and creation of jewelry in November '08. I travel throughout the United States instructing students on its use and teaching students abroad using video conferencing tools. The product used in my "Microwave Kiln Jewelry" workshops is known as the "MicroKiln" and my company, Designs by Sylvanye Glass Studio is one of its United States distributors. I have discovered that hands-on training (workshops, video conferencing, etc.) written detail instructions (step-by-step with pictures, graphics, and text) and an opportunity to ask questions (How? Why?) related to their design outcome ensures that they will create better designs, because they have gained an understanding as to what it takes to create a successful design or to correct the one they’ve created. You know the old saying, “You don’t know what you don’t know”. Well, its true…………..
Have you ever tried to fire a design in your microwave kiln only to have? · Glass melt into a blob. · Top sheet of glass slide off as it fuses to the base. · Fine silver clay shrink up into a ball. · Ceramic jewelry bisque melts and shrinks. · Glass stick to the base or side causing the kiln material to pull away. · Taking longer to fire designs. · And many, many more ………………. If any of these have ever happened to you, do not throw away your microwave kiln. I can help you resolve or at least understand the problem(s) and hopefully correct it the next time you use your kiln. 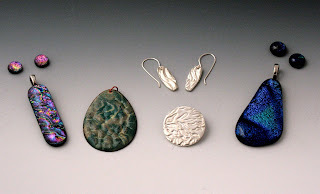 This blog has been created for those individuals experiencing problems using their microwave kiln to create jewelry designs. Solutions will be provided to you in the form of text, graphics, and or pictures. The solutions provided will come from a variety of sources but primarily from users like myself who have experienced these problem first-hand and have either solved them or found a work-around. This blog is not an instructional "how to create a design” but rather one that will help you improve or correct your existing or potential design. This blog will also assist you in learning about your microwave oven as well as your microwave kiln since there are so many on the market today. Let me start by showing you examples of the good, the bad and the ugly to see if you recognize any of these. In the meantime, I welcome your questions, comments and suggestions as well as pictures depicting your experiences. A picture of the problem you are experiencing helps a lot in determining a workable solution. Please be aware that all microwave kilns, microwave ovens and even fiber papers are not created equal. In other words you might have a friend that has the same type of oven (stove) as you, you both bake the same type of cake using the same ingredients and baking pan however; yours happen to turn out better. Something is different, what is it? Can you tell me what the problem is and what caused it in the samples below? - Melted glass, metal clay, etc. stuck to lining and pulled loose. - Portion of lining chipped off during packing or transporting of kiln. RESULT: Missing graphite lining will cause cold spots and result in glass not fusing evenly. SOLUTION: The MicroKiln Repair & Recharge kit will remedy this problem. - Glass or metal clay fired too hot too long. - Firing glass or metal clay without a fiber shelf & fiber paper. RESULT: Glass or metal clay burns hole(s) in kiln base. SOLUTION: Always fire with a 1/8" fiber shelf and 1/32" fiber paper. Fuse glass and sinter metal clay at the correct temp and rate based on your microwave oven's wattage. PROBLEM: Metal clay design melted. RESULT: Metal clay design destroyed resulting from over firing (fired too hot, too long or combination of both). SOLUTION: Fire and sinter metal clay at the correct temp and rate based on your microwave oven's wattage. PROBLEM: Black based dichroic etched design displays part of clear top fused glass layer on upper left of design. RESULT: Glass design not attractive and will need to be cold worked and fire polished to correct. SOLUTION: Top layer of glass needs to be properly cut and balanced over base glass otherwise the heat will cause the top layer to shift. Looking forward to hearing from you and seeing pictures of your designs.